Vanilla Fork Biscuits – Create, Make & Bake! Yesterday I made vanilla fork biscuits as a quick and easy thing to do. It only has 4 ingredients and is made it a few simple steps. 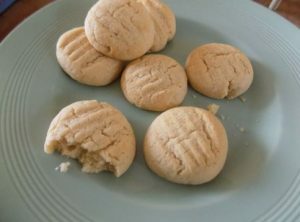 This is the easiest biscuit recipe I have seen so far and bakes very fast. 2. Add the flour and vanilla, combine together (this is pretty much the hardest bit). Preheat oven to gas mark 6/ 400*C/ 200*F. Grease a baking tray. 3. Roll mixture into Walnut sized balls and place on the baking tray. Press down slightly with a fork and bake for 7-8 minutes (told you it was fast). Enjooooooy. Pingback: St. Patrick’s Day Hats – Create, Make & Bake!